© 2019 NextBus Inc. All rights reserved. Covered by one or more of US Patent Nos 6,006,159; 6,374,176; 5,623,260; 6,411,891; 6,317,060; 6,415,207; 6,313,760 and 6,278,936. Vehicles are labeled by icons, along with arrows indicating their direction of travel. Stops are shown as small red circles along the route. 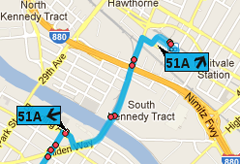 You can obtain real-time arrival predictions simply by clicking on a stop. If multiple stops are located very close together, arrival predictions will be provided for all nearby stops. minutes to go, e.g. "5 minutes"